At Fish & Co. 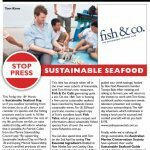 The Sustainable seafood cafe in Annandale we aim to inspire and educate our customers about how to eat fish and seafood in an environmentally responsible manner. As a chef and seafood restaurateur it is vital to be able ensure the quality and provenance of our ingredients. With fish and seafood we need to be able to confidently pass that message of assured sustainability on to our customers. By supporting the MSCâ€™s blue eco â€“ label restaurateurs are lending their support to those fisheries fishing sustainably. This Sustainable guarantee of fish and seafood is essential as it takes all the questioning out of ‘What can be fished for and eaten and what can not?’ It is cast iron proof backed up by scientific facts that can then be passed on to the consumer with confidence and clarity. My recent book ‘Fish Tales – Stores and recipes from sustainable fisheries around the world’ documents this proof of sustainability with lots of tasty recipes, many of which feature regularly on our menu at Fish & Co. The book is part travelog and a collection of recipes from 9 MSC certified fisheries from all over the globe. I wrote in partnership with a Dutch man call Bart van Olphen who has set up the first sustainable fishmongers in Europe and now has five stores around Holland and wholesales to large European supermarkets. The book Fish Tales has just won the Best Sustainable book in the World 2011 from The World Gourmond Awards in Paris. I am very pleased with the result, not just for all the people directly involved in the book, but for everyone who believes that Oceanic Sustainability is important and vital for the health of our planet. This award is for all the fisherman and fisheries, chefs and suppliers who are going that extra mile and striving to prove their sustainable status for a world stage. To mark sustainable seafood day on March 18th signed copies of Fish Tales are available at Fish & Co. The Sustainable Seafood Cafe at a reduced price of $30. rrp $45. The book is available from the restaurant and website through paypal along with jars of chilli jam and tartare sauce available for $8.50 to accompany your fish and seafood at home.